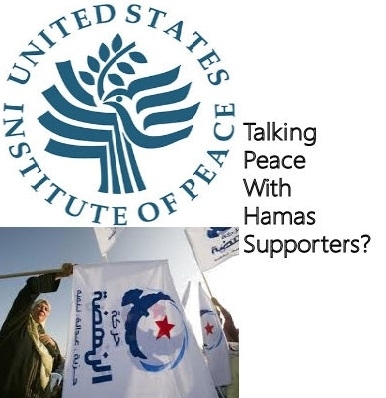 A pro-Hamas leader of Tunisia's Muslim Brotherhood-linked Ennahda Party met last month with the federally funded U.S. Institute for Peace (USIP) in Washington. The Nov. 29 meeting covered the relationship between Islam and democracy in the light of Ennahda's 10th Party Congress in May 2016, the Ennahda Abroad Facebook page said. There, the group agreed to stop trying using electoral politics to achieve its religious objectives. This change of tactics likely was caused by Ennahda's 2014 defeat in Tunisian elections. In Washington, Ennahda Shura Council President Abdelkarim Al-Harouni led a delegation which met with USIP Executive Vice President William B. Taylor and Vice President for the Middle East and Africa Michael Yaffe. The USIP defended its engagement with Ennahda and said it does not endorse Ennahda's position on the Israeli-Palestinian conflict, the organization said in a statement to the Investigative Project on Terrorism. "In order to prevent violent conflict and support Tunisia in its efforts to become a peaceful democracy, USIP has been facilitating dialogues in Tunisia since 2012. These efforts require USIP to engage with and maintain relationships with a variety of actors such as political parties, government officials, local officials, religious leaders, and civil society groups to ensure inclusivity. USIP does not endorse the actions or statements of any actor or political party," USIP said. "USIP consistently fails to do its homework to discern Islamists and avoid them. Instead, it welcomes them and thereby counters its own mandate to foster peace," Middle East Forum founder and President Daniel Pipes told the IPT. While Ennahda may have respected Tunisia's electoral outcome which forced it from power, its 2016 Congress took a page from Muslim Brotherhood founder Hasan al-Banna's playbook by emphasizing the need for Islamic education to gradually Islamize society from below over time instead of imposing Islam by the state. Al-Banna allowed participation in elections, but he taught that education was a key to Islamization. The party's politicians were barred from speaking or doing political organization in mosques. "It's not a separation, it's a takhassus (specialization)," Ennahda Shura Council member and member of the Tunisian parliament Farida Laabidi told The Washington Post in May 2016. "Our references will remain Islamic, but it's not logical for us to try to do everything from tarbiya (religious education) to making economic policy." Many Tunisians were ignorant of Islam and that education was needed to Islamize Tunisia, Ennahda founder Rached Ghannouchi said in 2012. Al-Harouni, who led the delegation at last week's USIP meeting, openly endorses Ghannouchi's anti-Israel policies. "Our Constitution urges us to support just causes in the world, foremost of which is Palestine," Al-Harouni said at a Nov. 7, 2015 Ennahda rally in Tunis. "Nothing will come from Tunisia except support for the Resistance and the Intifada. There will not come from it any normalization with the Zionist entity; we do not normalize with tyrants, occupiers, putcshists and terrorists. "...[T]he liberation of Palestine will pass through the liberation of the Arab world and that ... revolution launched from Tunisia will not be achieved except in Holy Jerusalem." "Resistance" is often a coded reference for violence. Hamas, for example, is a violent terrorist organization. Its name is an acronym, which translates in full to the "Islamic Resistance Movement." "The brethren [Ikhwan] everywhere are from the same blessed niche in [Mohamed] Morsi of Egypt, [Abdelilah] Benkirane of Morocco, [Recep Tayyip] Erdogan of Turkey, and [Mohamed] Sowan of Libya, and other countries of Islam in spite of all the smearing, forgery and brainwashing; a thorn in the side, and a wall against the disintegration of this Umma. They are the makers of the renaissance of this Umma, whose time has come. To God is everything before and after." Omeish was forced to resign from a Virginia immigration panel in 2007 after an Investigative Project on Terrorism video showed him invoking the "jihad way" for Palestinian liberation. He also lamented Israel's killing of Hamas founder Ahmed Yassin in 2004. Earlier this year, the internationally recognized Libyan government in Tobruk classified Omeish as a terrorist. A February 2016 Facebook post supported the al-Qaida-linked Mujahideen Shura Council of Derna. Ghannouchi, Ennahda's founder, called upon international organizations and "supporters of justice and fairness in the world" for political and financial assistance for Hamas-ruled Gaza during the July 2014 war between Hamas and Israel. A month later, Ghannouchi posted a photo of himself with then-Hamas chief Khaled Meshaal and expressed his solidarity with the Palestinians. Ghannouchi said he reached out to Meshaal and "congratulated him on the victory achieved by the people of Gaza against Israeli aggression which last nearly two months, and which left more than 2,000 dead and thousands of wounded, and a vast destruction of property." Ennahda issued a communiqué following this meeting denying that Hamas is a terrorist group. "[Ennahda] [c]onsiders the victory of the Resistance in Gaza is a victory for moderate Islam approach as opposed to the brutal forms of terrorism and violence associated with Islam," Ghannouchi's group said. Another Ennahda communiqué shows Ghannouchi meeting with Meshaal again on Sept. 13, 2014. Other top Ennahda members met with their Hamas counterparts in October 2014 to discuss where the resistance to Israel was headed, Ennahda's website said. Apart from his Hamas-related activities, Ghannouchi actively encouraged Tunisians to fight against the Assad regime in Syria, the Lebanese news website NOW News reported in October 2014. He allegedly told the parents of two young men who went to fight in Syria that it was "better for your son to die in Syria than here. He will be a martyr and he will mediate for you on Judgment Day. Fighting Bashar al-Assad is better than staying here." Ghannouchi's rabidly anti-American and pro-terrorist stances led the Clinton administration to bar him from entering the U.S. in 1994. Ghannouchi advocated the "destruction of the Jews" during a 1990 conference in Tehran, and also invoked Ayatollah Khamenei's "call to jihad" against America, "the Great Satan. The allies of Zionism are the allies of Satan." The Obama administration lifted the ban on him entering the U.S. in the fall of 2011 even though copious evidence showed that Ghannouchi still supported terrorists. That May, Ghannouchi invoked Yassin's prediction that Israel would be eliminated by 2027. "I say that this date may be distant," he told Qatar's Al-Arab newspaper. "Perhaps Israel will disappear before that." Ghannouchi was joined at the USIP meeting by two people on whom he has long relied to lobby on his behalf in the United States. Radwan Masmoudi is president of the Center for the Study of Islam and Democracy (CSID), and Mongi Dhaouadi, who is tied to CSID and has been the Connecticut director for the Council on American-Islamic Relations (CAIR). CSID has had a close relationship with the State Department and members of Congress. Masmoudi played a key role in establishing contact between the U.S. Embassy in Tunisia and Ennahda, an August 2006 State Department cable said. It also acknowledged that Masmoudi received money from the State Department's U.S.-Middle East Partnership Initiative (MEPI). A November 2016 U.K. Parliament report describes Masmoudi as "an advisor to the President of Tunisia's [Ennahda] party," meaning Ghannouchi. Masmoudi belonged to Ennahda in the 1980s and 1990s, TunisiaLive reported in August 2012. CSID has repeatedly hosted Ghannouchi at U.S.-based events since the Obama administration granted him a visa in 2011. Dhaouadi, a Tunisian-born senior program officer with CSID, also has worked with Ghannouchi and participated in Ennahda Party activities in the past, such as its May 2016 Congress. An Ennahda Party Abroad Facebook post describes Dhaouadi as the "Representative of the American Bureau." Like Ghannouchi, Dhaouadi supports terrorism against Israelis. However, he denies that Palestinians who kill Israelis are terrorists. "Resisting the occupation is NOT terrorism it is a legitimate right of defending oneself from your land from real terrorists i.e. IDF," a 2015 post shared by Dhaouadi on his Facebook page said. Dhaouadi also supports the Boycott, Divestment, Sanctions (BDS) movement against Israel. He also showed support last June for Shiekh Abdel Majid Al-Zindani, who is listed by the U.S. Treasury Department as a Specially Designated Global Terrorist due to his ties to al-Qaida. Treasury officials noted in 2013 that Al-Zindani is a "spiritual leader" to al-Qaida in the Arabian Peninsula (AQAP). Despite this supposed moderation at home, Ennahda clearly supports violent Islamic revolution elsewhere, particularly in the Palestinian-Israeli conflict and in Syria. Unless USIP officials challenged Ennahda on these issues, its meeting likely did little to advance the cause of peace.